At the end of March, I became an aunt to what is surely the world’s most adorable baby girl. Unfortunately, shortly after my sister delivered her little bundle of joy, baby and mom were separated, and my little niece’s home for the first two days of her life was the NICU. Unlike most cases where babies are rushed to the NICU, this was largely to protect her from potential harm instead of to address a current health issue. You see, my sister was in the throes of a terrible bout of the flu, which I am told made labor and delivery an even less pleasant experience than what it already is normally. With a fever of 103, uncontrollable shaking, fainting, constant nausea, and other symptoms that are a reminder of just how different true influenza is from a bad cold, my sister was quarantined from her daughter. Then my sister’s husband caught it. Thank goodness for vaccinated grandmas. Although flu shots are nearly mandatory for pregnant women, changes in providers and miscommunication about recommendations meant my sister never received hers. Her husband, a Navy diver, should also have received his, along with all his fellow servicemen and women; however, he was serving a short tour in Guam during flu shot time, and missed out. It wasn’t intentional that they didn’t get their flu shots; it just wasn’t a priority for them. Although my sister doesn’t live in Colorado, and the flu shot is different than other vaccines because it only protects against certain strains of the virus, this issue resonates with me. Colorado is notorious in the public health world for its low rates of immunization. One in four Colorado kids is considered under-immunized, and our Kindergartners have the lowest measles vaccine rate in the US. According to data from the state, only 44% of adults received a flu shot in 2014, and blacks, Hispanics, and low-income Coloradans were least likely to be vaccinated. When CCMU talks about the underserved, we are largely referring to those who are vulnerable to poor health due to something they have limited or no control over—their race, their economic situation, the availability of health care services in their community, and other life circumstances. 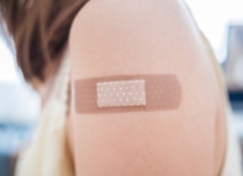 In the case of vaccines, the immunization gap is both a result of these social factors and decisions by individuals to actively or passively forgo evidence-based medical recommendations. Compounding the problem is that this growing group of underserved individuals that are unvaccinated and vulnerable increase the vulnerability of the rest of our population by decreasing our herd immunity. Ensuring all Coloradans are protected against vaccine-preventable diseases has a number of important benefits. For one, it reduces health disparities. It also reduces health care costs; in 2013, vaccine-preventable diseases contracted by children resulted in $29.2 million in hospital charges. And, most importantly, it saves lives—up to 33,000 per year in the US. Colorado has taken small steps in the past few years, increasing transparency on immunization rates and pursuing changes to vaccine purchasing policies, but there is much more to be done to increase access to and education about vaccines. I hope Colorado will continue to work with families and providers to alleviate fears and seek ways to boost immunization rates in both children and adults. After my sister’s experience, I checked and double-checked with my provider to make sure I’m up-to-date on all my vaccinations; when my own little one arrives in June, I’m confident he and I will be protected as best we can be. If only there was a vaccine to protect against sleepless nights!